One spends a very long time listening to a "difficult" album so that one can provide a fully formulated and well-judged opinion. You have enough adjectives to fill a very lengthy review. You are however not sure that your extensive vocabulary will really enlighten readers as to the desirability of the disc in question. You are also about to move house and have a lot of packing to do. Do you set aside several hours you don't actually have, to write an in-depth review that will justify the length of time you've spent weighing up the value of said album. Or do you simply jump straight to your conclusion and carry on with the packing? Consideration: Careful thought, typically over a period of time. ILLUMION was formed in 2002 by Eveline van Kampen (guitars, Chinese Viola and mandolin) after her graduation from the conservatory of Alkmaar's guitar jazz and pop department. I really enjoyed and still revisit the debut album from this intriguing Dutch band. Progress Records released Hunting for Significance in 2009 and it received a very positive review on DPRP with a special emphasis on its individuality. The band has clearly spent a lot of time on creating a worthy follow-up. There are layers and layers and layers of detail packed within every track on The Waves. This is definitely Prog but not as we know it. The voice of Esther Ladiges may be closer to what you'd expect in a jazz or folk ensemble. It is an unusual combination but one that I find both endearing and effective. Equally I simply adore the ever changing depths and variation in the compositional style and the instrumentation. Most songs are written in complex, non-standard time signatures. This really is thinking man's (or woman's) Prog. Conclusion: The summing-up of an argument. Any further description would be futile. A track by track commentary would confuse more than clarify. 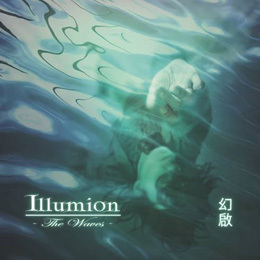 Illumion stands as a band beyond comparison. <="" i=""> is a wonderfully ambitious progressive rock album. There was a temptation to describe this as "Headphone Prog" - modern progressive rock that required one to sit down, pay attention and really listen. The breadth and depth of sound on this wonderfully produced album means that headphone listening will be the best starting point. The Waves does take some careful listening to fully engage with. However I found that once I became familiar with the music's twists and turns, it offers an equally enjoyable listen in the car stereo. Adding to the originality is the fact that Freia Music appears to be chiefly promoting this album as a high quality double vinyl album. It is available on CD too. But that version has only the 9 songs covered here. The vinyl version has 12 tracks. This is such a great listen, that for the first time in two decades I shall go out and buy this album on vinyl! That is after I've finished my packing!